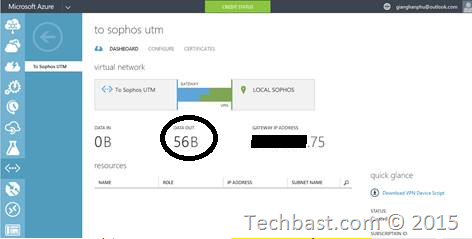 Sophos UTM can connect with Microsoft Azure, site to site VPN in Static routing VPN Gateway. 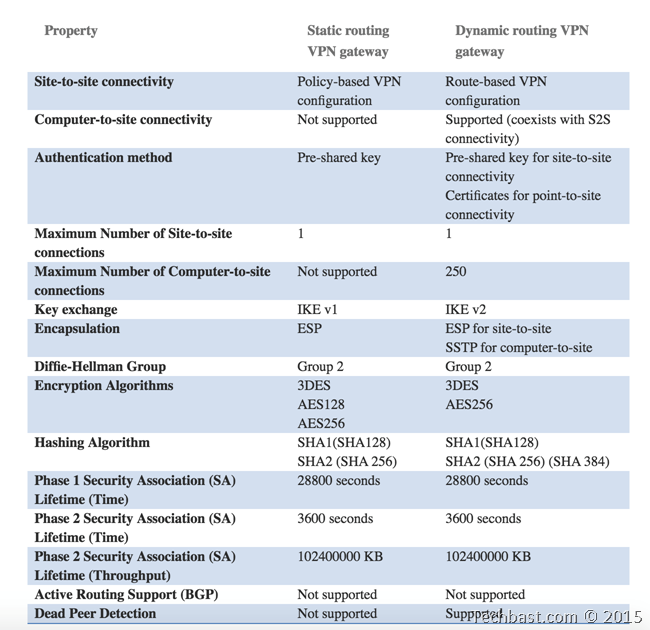 The table below lists the requirements for both static and dynamic VPN gateways. 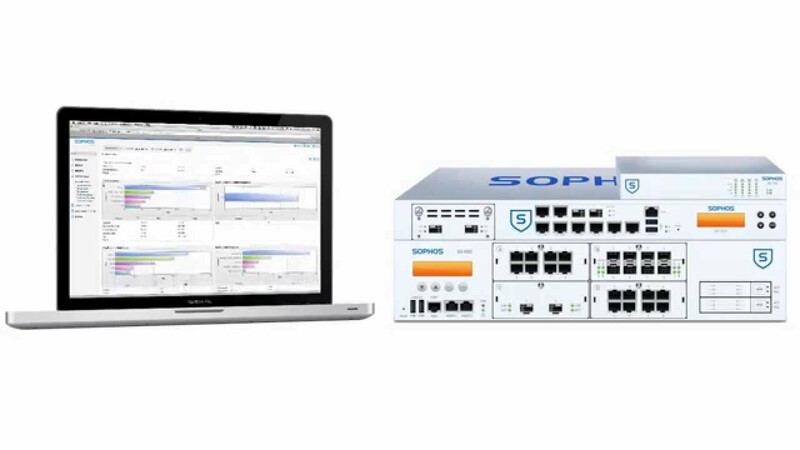 Note that for the remainder of this page, the specifications for High Performance VPN gateway and Dynamic Routing VPN gateway are the same unless otherwise noted. 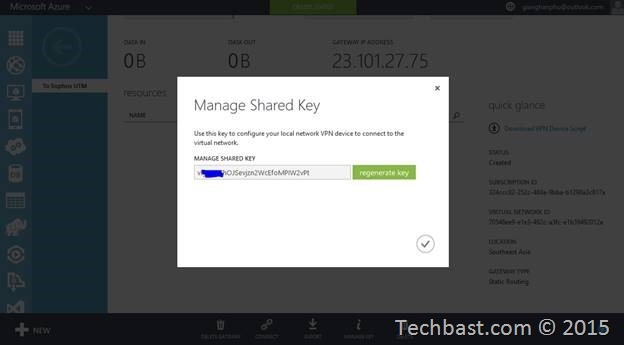 For example, the validated VPN devices that are compatible with Azure Dynamic Routing VPN gateways will also be compatible with the new Azure High Performance VPN gateway. 2.1. Log in to the Management Portal. In the lower left-hand corner of the screen, click New. 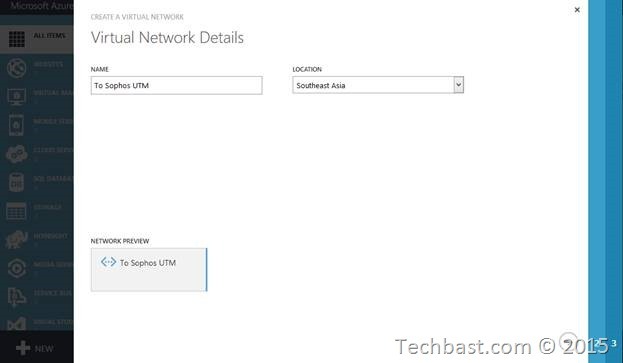 In the navigation pane, click Network Services, and then click Virtual Network. Click Custom Create to begin the configuration wizard. On the Virtual Network Details page, enter the information below. For more information about the settings on the details page, see the Virtual Network Details page. Name – Name your virtual network. For example, EastUSVNet. You’ll use this virtual network name when you deploy your VMs and PaaS instances, so you may not want to make the name too complicated. Location – The location is directly related to the physical location (region) where you want your resources (VMs) to reside. 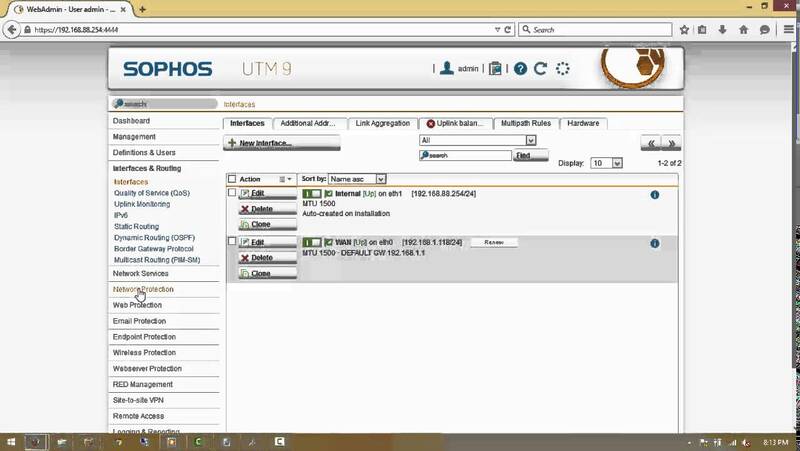 For example, if you want the VMs that you deploy to this virtual network to be physically located in East US, select that location. You can’t change the region associated with your virtual network after you create it. · Address Space – including Starting IP and Address Count. 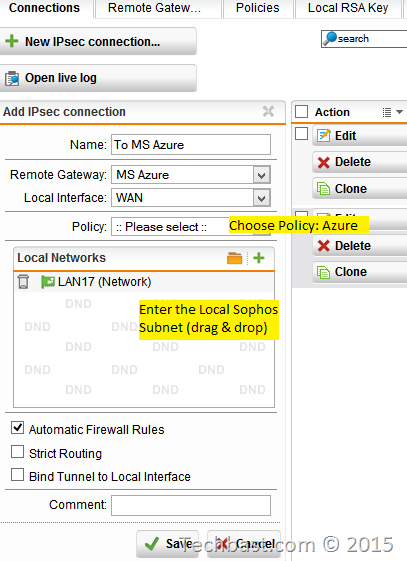 Verify that the address spaces you specify don’t overlap any of the address spaces that you have on your on-premises network. 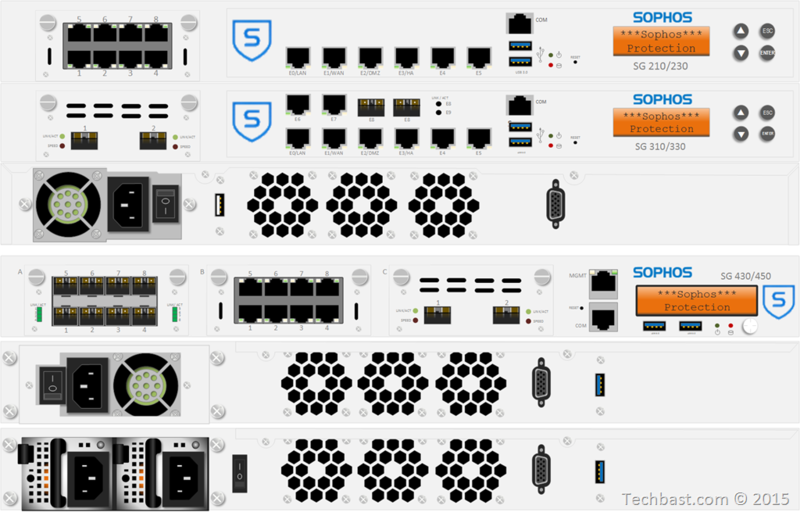 · Add subnet – including Starting IP and Address Count. 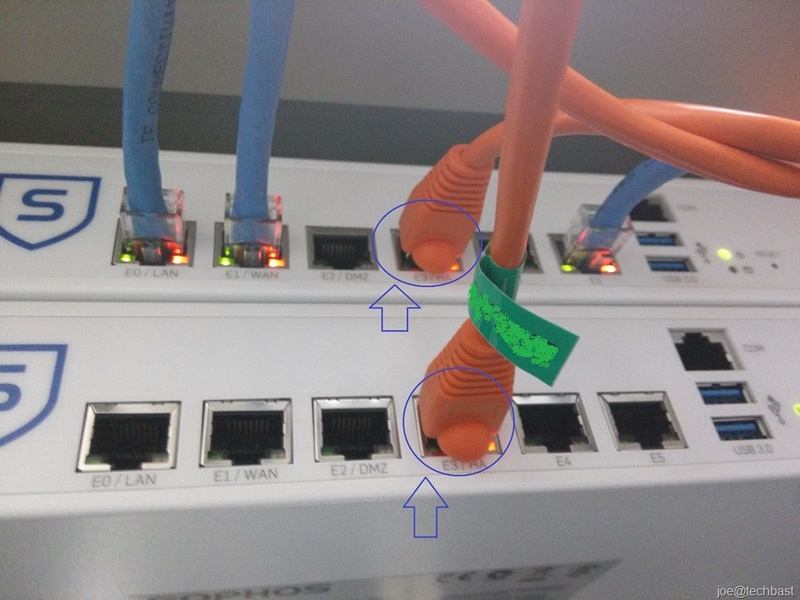 Additional subnets are not required, but you may want to create a separate subnet for VMs that will have static DIPS. 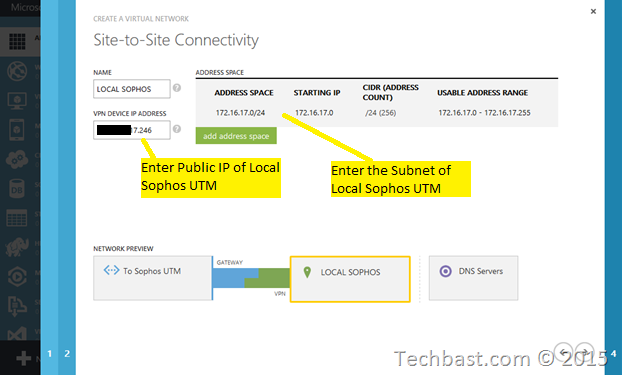 Or you might want to have your VMs in a subnet that is separate from your other role instances. 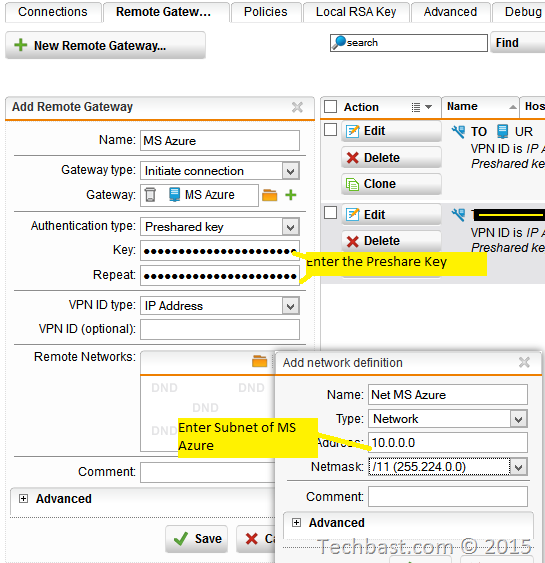 · Add gateway subnet – Click to add the gateway subnet. 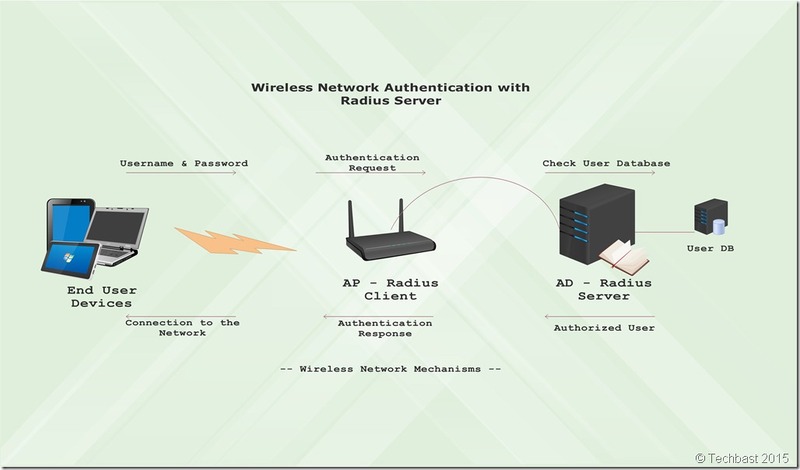 The gateway subnet is used only for the virtual network gateway and is required for this configuration. Click the checkmark on the bottom of the page and your virtual network will begin to create. When it completes, you will see Created listed under Status on the Networks page in the Management Portal. 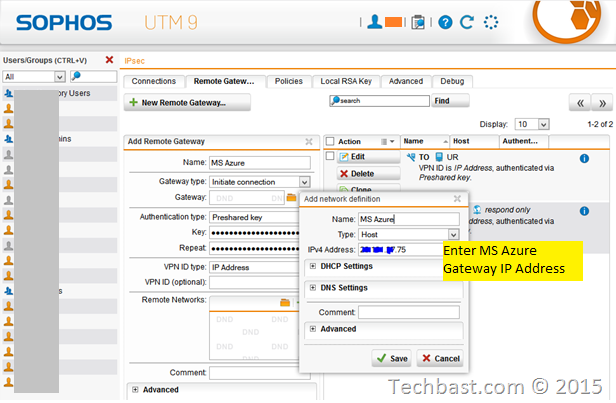 · See the Microsoft Azure Gateway IP Address after create gateway successful. 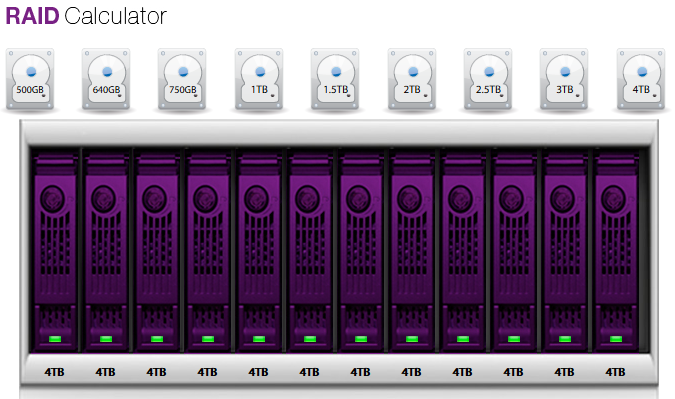 Hello there, You have performed a great job. I’ll certainly digg it and for my part suggest to my friends. I’m sure they’ll be benefited from this website. 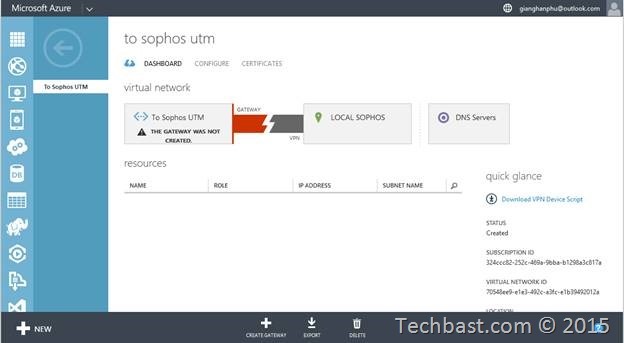 Nice article, got my UTM and Azure connected using these steps. Thank you for such a great and detailed instruction! 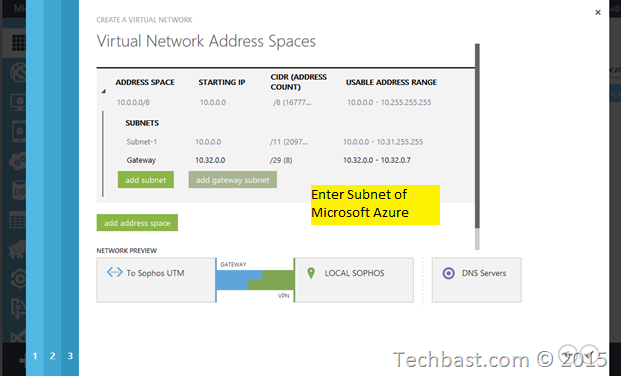 Any chance you could also add some more details on how to create another subnet in azure in the same address space and make it routable with on prem vlans? This is Great. I made some modifications to my connection for the Policy based on your information. I hope that it stays up and running. 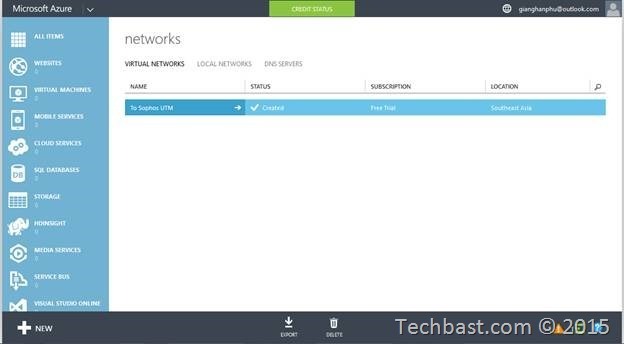 the issue I have been having is that it keeps loosing connection with the VPN in azure. One minute it is able to ping and get through the next it is out. 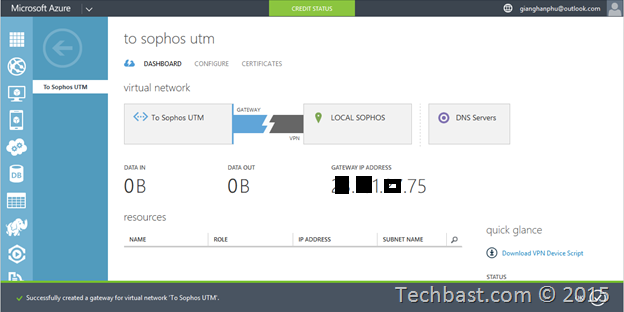 I restart VPN tunnel on the Sophos UTM and it comes right back up. I am not sure what is causing this I am hoping the changes I made to the Policy fix this issue. Or others including the original poster, have you seen any improvement to frequent connection issues requiring you to reset the tunnel to fix it? We are also seeing this problem. I know this is an old topic, but I also had the disconnecting problem. Looks like it’s because the IKE SA Lifetime needs to be 10800 instead of 7800. 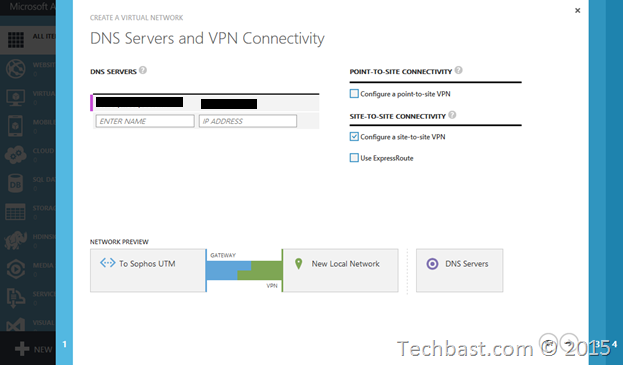 See https://docs.microsoft.com/en-us/azure/vpn-gateway/vpn-gateway-about-vpn-devices for more info. This won’t work if you need multiple site-to-site tunnels. Please read this guide instead. 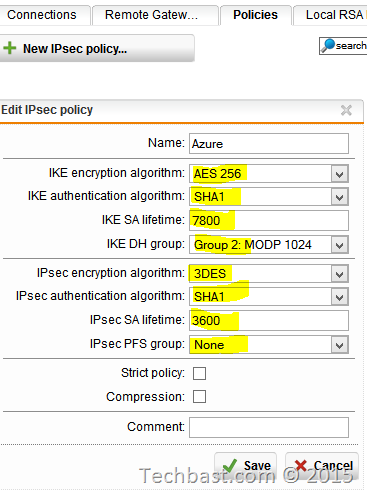 I had this setup working properly for a whole year with Lifetime 28800 for the IKE but now all of a sudden I get disconnects when this key gets recreated after 28000 has anyone experience this here Azure links dropping at Re Key?